To break such a crackme, you only need to find this comparison and sniff the correct serial. This is a very common approach in x86 world but in .NET world it's not that popular yet. As for my target, I'm using "RDG Simple Crackme .NET v4 2015"
In x86 world you can use GetProcAddress function to get address of any API function from any DLL. Can we do something similar in managed environment like .NET? It turns out that we can, but it's a little bit harder. This works well with static classes and static methods. How about non-static methods like RijndaelManaged.CreateDecryptor(byte, byte)? There are a few gotchas, however.. In case your target type is located in assembly that's not NGEN'ed yet, I suggest that you use ngen and install the assembly in cache. That can prevent certain problems later. Addresses of functions are obviously different in .NET 2.0 and 4.0. 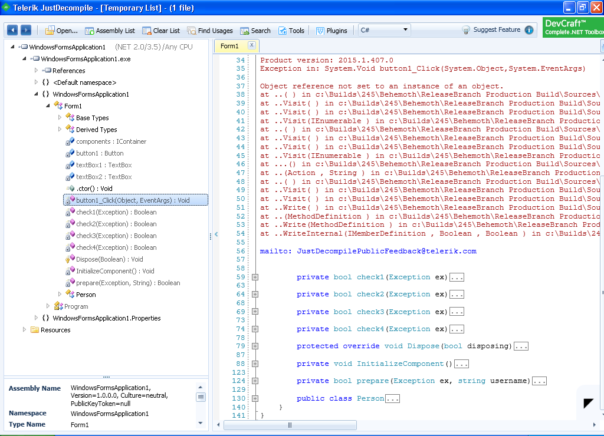 You must compile for correct framework version and target the correct .NET assembly. Addresses of functions are different for x86 and x64 framework versions, too. Make sure your assembly is compiled correctly. 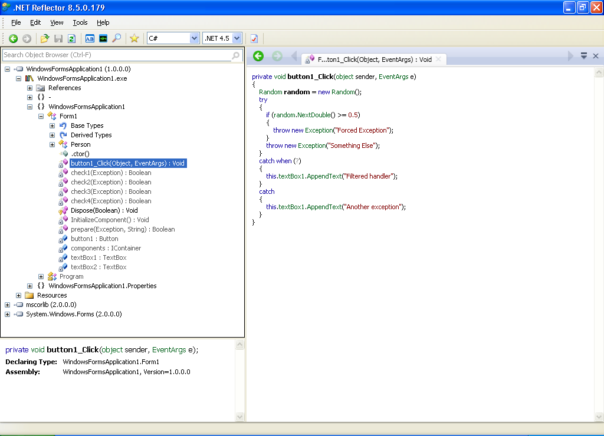 Suprisingly, string comparison in VisualBasic.NET and other .NET languages is different. It's caused by Option Compare statement present in Visual Basic language. So, if the crackme is made in VB.NET, you need to examine Operators.CompareString(string,string,bool) function. For crackmes made in other languages, you'll need to examine string.Equals(string) or some other variation of this method. So, using the code I mentioned above, I learned that address of Operators.CompareString(string,string,bool) on my PC is 599F1D30. Now I need to sniff data passed to this function. There are several possible approaches. You can try using VisualStudio & Reflector plugin as SpoonStudio tried, you can try using ILSpy and it's debugger plugin, or you can inject DLL into crackme process, as suggested by noth!ng - but I prefer to use OllyDbg. Load crackme in OllyDbg, make sure that all the anti-anti-debug plugins are working, all the exceptions ignored, put a breakpoint on 599F1D30 and hope for the best. Nope. Operators.CompareString is called literally thousands of times. So, we need to do something smarter. 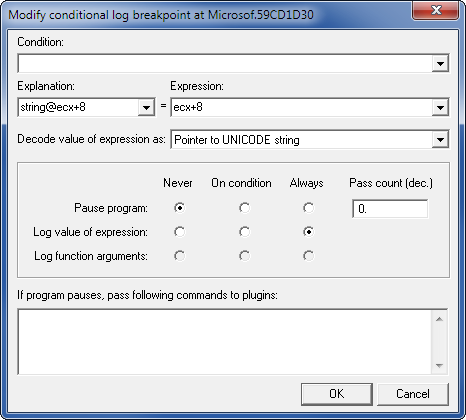 Place second breakpoint at the next instruction (59CD1D31) and log string at edx+8. My entered serial was "1234567890123456789012345678901234567890" and it's being compared to "C49476D583364356253377056314435396D456F44796C7A55746431564433544". Hmm, could that be the correct serial for my nickname? wink Yes, it is! 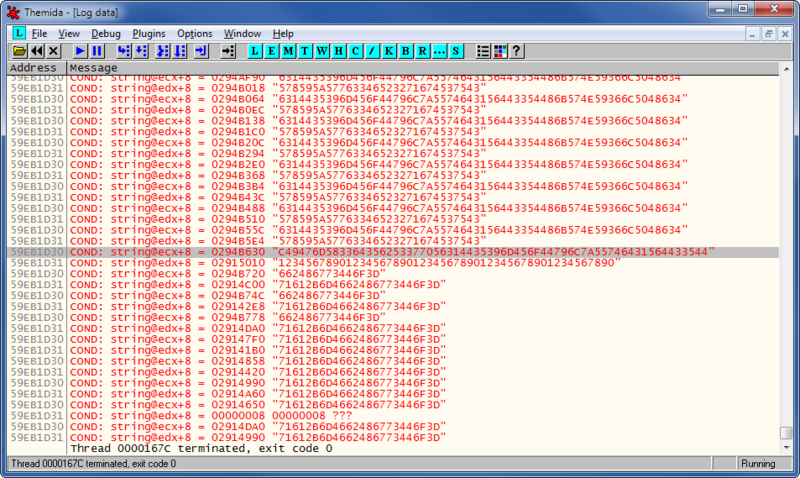 This was quite nice crackme and I only showed the simplest way to beat it. When you start looking into it, you'll find some nice anti-debug tricks, some nice anti-patching tricks and pretty nicely obfuscated code. But that's a matter for another story. Have fun! Two days ago Google released Chrome 42. It's the answer to life, the universe and everything. 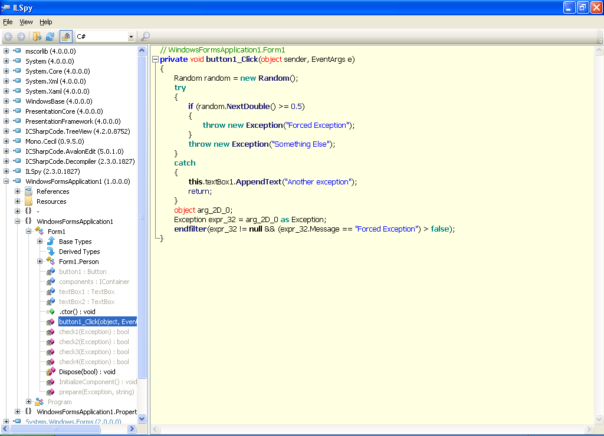 And among other things, it disables all NPAPI plugins by default, finally putting that Java nightmare into it's grave. Good riddance! But what about other NPAPI plugins? Like, you know, the ones used for electronic documents, digital signatures and other e-government thingies? Welcome to the 21st century. If you're Estonian, that is..
Until now C# supported try/catch but did not have support for filters. That's going to change in C# 6.0/VS2015. In early versions of VS2015 the syntax was "catch-if", as you can see in the initial announcement. In the latest VS2015 CTP builds, they changed syntax to "catch-when", and there's a good reason for it. So, how does it work and what does it mean for reversers? As I mentioned before, .NET Framework has supported exception filters since the very beginning. So, this feature works even in .NET 2.0 - if you decide to target .NET 2.0 Framework in VS2015 project settings. Not that you really want to do that..
catch-when is implemented as an IL exception filter. So, when an exception is thrown, exception filters are processed before the stack is unwound. This means that filter method has created an error report that included the current stack trace, it would show the frame in which the exception occurred. Sounds complicated? It isn't.